One Hot Stove: SHF 23: The Surprise Inside! SHF 23: The Surprise Inside! No, no, I am still not done with my thesis...several more weeks to go, but I popped up from my hibernation to participate in one of my favorite foodie events, Sugar High Friday. This month's SHF (#23, can you believe it?) is being hosted by the veggie evangelist, that champion of fresh and healthy vegetables- Alanna of Veggie Venture. Alanna has chosen the rather mysterious, open-ended theme: Surprise Inside! So what surprise do I have in store for you? This box contains a bona-fide dessert (sweet and rich and milky) which...SURPRISE...contains a full serving of vegetables. A nutritious vegetable at that. Yes, this is a simple little carrot kheer. I am thrilled that I could sneak in veggies into the sugar high in honor of the Alanna, who sure loves her vegetables. Kheer is a catch-all term for a bunch of stove-top Indian desserts. You barely need an excuse to make kheer: a birthday, a festive celebration, a family gathering is reason enough to make a big pot of this creamy dessert (it closely resembles rice pudding) to be scooped up by the bowlful. A garnish of nuts and raisin to add to the celebration! The classic Indian carrot dessert is actually a much thicker pudding called gajar halwa but I love carrot kheer instead because it is easily cooked in 20-30 minutes. The only specialty ingredient required is cardamom; the other ingredients are pantry staples (or available at any old grocery store). The saffron, added for the delicate golden orange-yellow glow that it imparts to the kheer and for its prized subtle taste, is not required in this kheer. The copious amounts of beta-carotene in carrots give the kheer a lovely sunshine hue. Making kheer the traditional way requires a couple of hours of patient stirring to thicken the milk into the right consistency, but here I use evaporated milk to shorten the cooking time a great deal. Shred the carrots by hand (quite a workout) or using a food processor. Heat butter/ghee and sauté the carrots for 3-4 minutes. Stir in the milk and sugar, then cover and simmer for 10 minutes or until the carrots are tender. Stir in the evaporated milk and cardamom, then cook uncovered for 5 more minutes. Taste for sugar and stir in more if required. Chill the kheer, then serve topped with nuts and raisins. This kheer was made in St. Louis when I was visiting over Labor Day weekend. 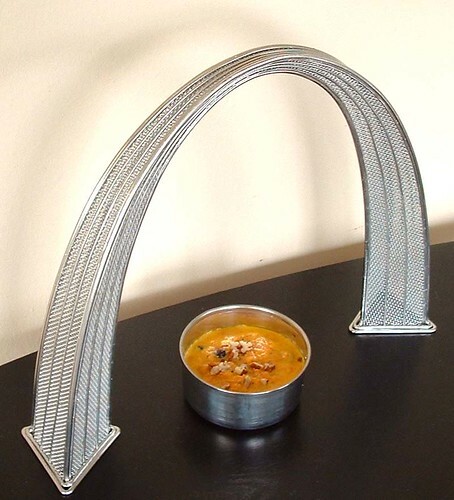 I will be moving there in a few months, so One Hot Stove will soon come to you from the Gateway to the West, St. Louis. Nupur, let me be the first of the St Louis/Nearby food bloggers to welcome you into our small cadre! Here's wishing you and V (and Dale! Lady woofs) a very happy home here! Nupur, so good to hear from you again! I was just reading a post about the City Museum in St. Louis(it's supposed to be fantastic) and thinking about you and V. This kheer sounds delicious (I think I was the only kid in elementary school that actually liked carrot and raisin salad) and I love that it's lowfat. Hope things are going well with your thesis! Hi there! A premature welcome to St. Louis! I moved here a few months ago from the est coast after finishing my thesis......Its a great place...and the veggies taste better! Best of luck with thesis & enjoy the last few days of grad life. One misses it more than one thought possible! I would love to be surprised with this any day! What a great surprise. Just the box alone is breathtaking. Good luck with the move. I'm hoping you'll be there for the workshop so I can get to meet you. Carrot Kheer seems very similar to the North Indian/Pakistani sweet called Gajrela - allegedly Nawaz Sharif's favorite food after burgers, though that's beside the point! Is the term Gajrela ever used in Marathi cookery? Really a great surpise!!! Good luck. Hi Ashwini, The box is beautiful, right? It was a birthday from my dear friend Revati, who bought it from the artist who hand-crafted it. AK, this was so much fun! Carrots do taste wonderful in desserts (carrot halwa is one of the most popular Indian desserts, and we love carrot cake too!). Can't wait to end this "transition" and move to St. Louis soon! Cathy, thanks *so* much for this post! I am really looking forward to seeing this museum. Better yet, you should visit me and V in St.L and we can all go visit it together! Hi Kalyn, I was so looking forward to the workshop but there is only a very slim chance that I can be there. I do hope we can meet sometime soon though! Krithika, thanks for stopping by! Haripriya, Menu today...thanks for the comments! thanks for writing in something. i always check ur blog to see if there's something new because i can always catch some inspiration from your blog when someone like me is totally confused what to prepare! thanks for visiting! I actually mixed the dressing the the beans all together before and even popped them in the fridge for a bit. I was pleasantly surprised by the way that the dressing help up. Just needed a bit of a toss to be perfect. Lemme know in case you want to know smthg abt the STL area. Am still new......but might be able to help. ps: you dont have to tell..are you joining a univ. in STL? 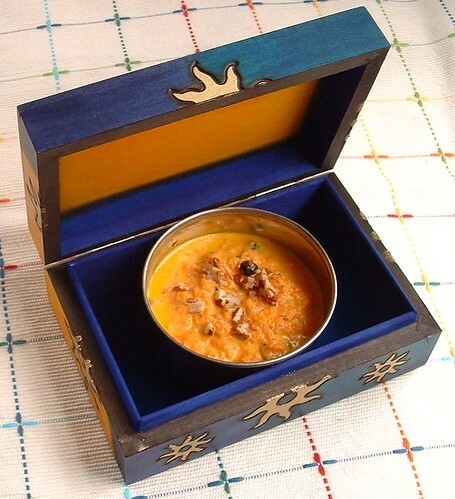 What a beautiful box and yummy Kheer! Good luck with your thesis and move to SL. Looking forward to seeing you blog regularly after your thesis. King and I- Kingshighway. *AMAZING* thai food. I have not had its equal (several close!) here..
India Palace-google it with saint louis- Yes, it's by the airport. Yes, it's in a Howard Johnsons. Yes, it looks like it was formerly a Hawaiian-themed joint. *BUT* my mother (another picky bengali) proclaimed the Chicken Reshmi, "really really good" and took some home to my father (they live in Washington State). The saag paneer is excellent as well. Of course- Ted Drewes. Some native St Louisans claim Fritz's is better, but that's just CRAP. Crater Copernicus (A brownie with vanilla frozen custard and hot fudge and nuts) is the king of all sundaes. The Bunny-crete (around easter) is a glorious carrot cake broken up and spun into their base custard. Around Thanksgiving, they do the same with pumpkin pie. How I miss it! Perfect summer treats. And finally, the Hill for homestyle italian. It's to your discretion whether or not you partake of 'St Louis-Style' pizza. An acquired taste at best.. esp. after NY pizza. But it can be good--there's Farracci's out in the county (outside St Louis proper, heading west).. I found your blog last month, just when you had taken your break! So this is the first new post I'm seeing, and I just want to comment that it is gorgeous, as is your whole blog- a perfect marriage of art and food (and science!). Good luck with your thesis, I just started writing mine, so it's inspiring to see someone close to the end! It looks wonderful, and it's great to have you back! I've had a small wedding gift for you, for some time, but have been unsure where to send it. Could you let me know which address to use? Hi Nupur-lovely to see you back, if only for a moment. This comes at just the right time for me. I'm struggling with an excess of lovely CSA carrots, and was running right out of ideas. What a nice presentation, too. Hope the dissertation is going well, and you will be returned to us soon! Nupur, this is wonderful. 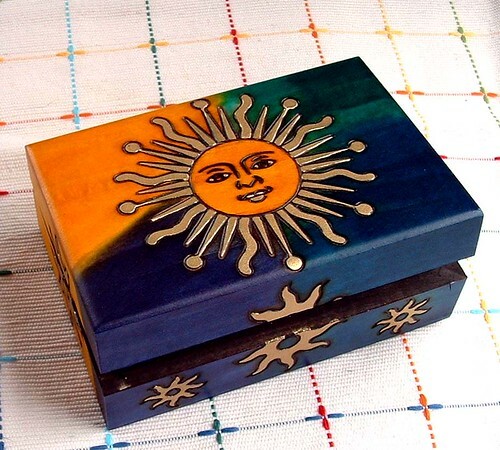 I love the sweet box, and the kheer is something I would love to try. The Box looks wonderful.. The kheer looks attractive and yummy..
check out my version of carrot kheer too. Hi Bee, I hope I can start blogging regularly in a couple of months! Gunjan, I hope to try your salad soon. Thanks for the tips! Dbdtron, how nice of you! I can't wait to try out all your reccs! Stephanie, how sweet are you??! Hi Lindy, it is so nice to see you again :) I can't wait to start blogging regularly again...it feels so odd not writing posts and eating food without photographing it! Lisa, Prema Sundar, thanks for stopping by! Mouth watering dish, not easy to make, you have perfected it. it makes the carrot kheer looks like a rajeshahi dish right? It’s for fun , the main objective is to a little closer to each other. That was so cute! I loved the box and the dish inside. I was kind of surprised to see a post but glad nevertheless. Good luck with the move. I just got this code for the Time Out eating event on Tuesday. I went last year, and there’s a bunch of restaurants giving out free food, cool music and there’s a couple of open bars for the whole night. There’s a coupon code (TONYVIP) you enter at check out so you can get them for 20% off your tickets if you buy them before Tuesday. It’s a really fun event, and I think you get a gift bag and a free subscriptions, too. I tried your kesar-pista nankatai today. Mine came out swell! I added an eggwhite to the mixture and didn't pat the dough too flat. It worked. They were just like the ones we get in desi stores. Nupur, I tried your chawli amti today...it was awesome! Thanks for sharing the recipe. I am so coveting that book now! I have posted a food trivia quiz on my blog. Have a look at it when you get a chance. Happy Diwali to you and your family. I'm half-Marathi and Half-Konkani...found your site by googling for thalipeeth. Love it already! I think I wished you a happy Diwali on an old post. Oy! Well the wishes still apply. I hope you post more often as a fellow foodie, will love reading your blog. Oh and I am Marathi too.. Interesting that you are now the second Marathi blogger that I know. I just tagged all the St. Louis food bloggers for this meme, but no pressure, only if you think it sounds fun and have time to do it. Here is my personal invitation to participate at VCC Q3 2006. The deadline has been extended to Oct 31. See you at the show. Cheers! Nupur, here's wishing you and yours a wonderful Diwali! The first Diwali after getting married is supposed to be extra-special! Hope it is! Good luck with the move and hope you settle down soon! Came across your blog when i searched for Maharashtrian food on google.In the process found out tons of other great recepies from your blog...cant wait to try them out..